Great Event Happening For @ALZSOCWW in #Guelph Sept 15th! 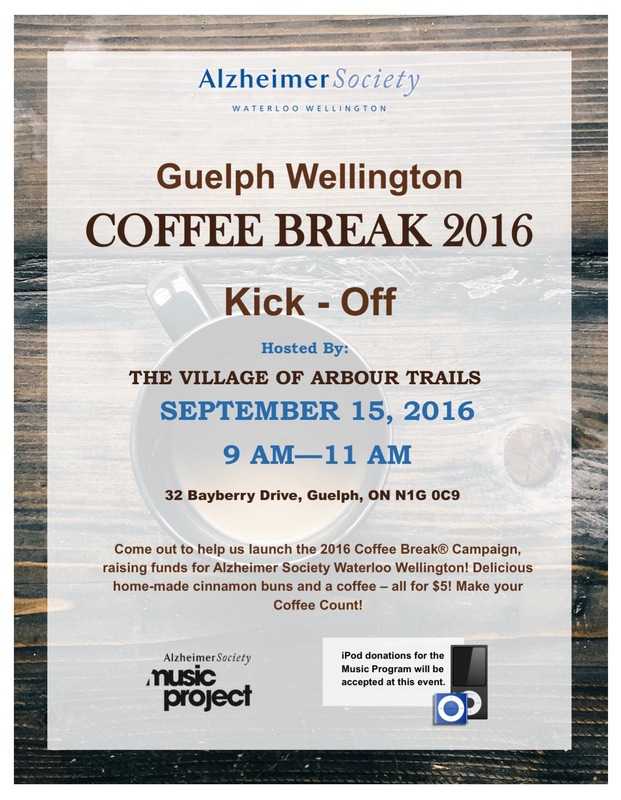 Coffee Break® is an annual nation-wide fundraiser in support of Alzheimer Societies across Canada. Each Coffee Break® hosted supports their local Society – so this year’s participants will help to support over 14,000 individuals living with dementia and their families and care partners right here in Waterloo Wellington. Last year, we were able to meet our goal with over 70 Coffee Breaks® hosted across the Region, raising an outstanding total of over $46,000, thanks to the support of our generous community. Every fundraising dollar is being used in local programs and services, providing resources, support and programs for people affected by dementia and Alzheimer’s, as well as their families and care partners. The Guelph Wellington Launch is on Thursday September 15th, 2016. ← Missing 14 Year Old #Guelph Boy Located!